Eugène-René Poubelle was préfet, or regional administrator, in charge of the Seine département, essentially Paris and its suburbs, from 1883 to 1896. What he did while he was there has left a permanent mark on French life, and on the French language. Does his name sound familiar to you at all? Paris in the late nineteenth century had a problem. Two million people lived there, and two million people create quite a lot of rubbish. It was Poubelle’s job to come up with a system to deal with it. His solution was surprisingly far-sighted: he didn’t just introduce the bin, he introduced three bins per household: one for perishable rubbish, one for paper and cloth, and one for crockery and shells. It was a precursor of modern recycling. The boxes were known as boîtes Poubelle, soon shortened to poubelles. While the three-box rubbish-sorting system may not have endured, the name has stuck. Not only did the French honour M. Poubelle by naming their rubbish receptacles after him, the Parisians gave their préfet one of the greatest marks of respect the city can offer: they named one of their streets after him. In the swanky sixteenth arrondissement, home to Paris’s most expensive real estate, you can find the Rue Eugène Poubelle. Last month, an apartment on this street sold for 1 440 000 euros, which is a lot of money to pay to live at an address that very nearly translates as Trashcan Alley. …..And one other thing. I was contacted a few weeks ago by the BBC to ask if I’d mind verifying the definitions and pronunciation of some French words they wanted to use in their CBBC ‘comedic panel show’, The Dog Ate My Homework. (I know, the life of a Schools Liaison Officer is just an endless round of showbiz glamour.) All of the words seemed to have been picked because they sounded funny, and inevitably, poubelle was one of them. Ever the educator, I insisted that they couldn’t say la poubelle on air without at least a nod to the memory of the great M. Poubelle. Will they mention him? Probably not. We watch a lot of CBBC in my household, owing to the presence of a number of eight- and nine-year-old boys, but I haven’t seen the show yet. If you catch it, and Eugène makes it to air, please let me know! One of the things you can study as a modern linguist at Oxford is linguistics, either within the French course or as a subject in its own right. Linguistics is the analysis of how languages work, and how they change over time. One option in our degree is a course that traces French right back to its roots, and then examines how it gradually develops over the course of centuries into the language we recognize today. I thought you might like a little taste of this, with a trip back through the mists of time to the earliest peoples to have left their mark on the French language: the Gauls, the Romans and the Franks. First up, the Gauls. The Gauls were a Celtic people who settled France some time around 600 BC. They weren’t the first people to arrive in France: the cave paintings at Lascaux were painted fifteen thousand years earlier, and stone tools have been found in the Hérault département that date back one and a half million years. The Gauls came to dominate the culture and language spoken in the territory that would become France, however. Only the Basque language spoken in the far south-west and across the border in northern Spain preserves an echo of the speech of earlier populations. For French, the Gauls are our starting point. While the Gauls may be the ancestors of many modern French people (and many more, raised on the adventures of Asterix and Obelix, would very much like to think so), their language has left much less of an imprint on French than that of the invaders who were to conquer them, the Romans. 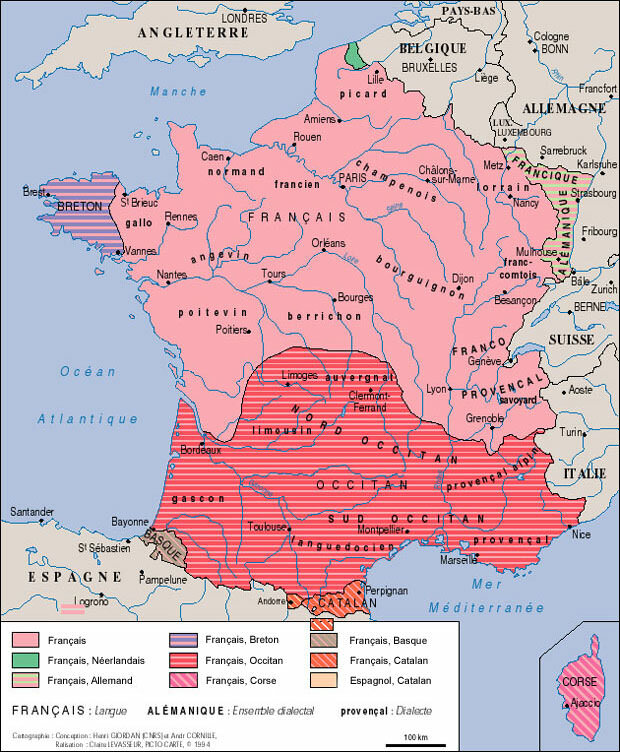 Latin is the real root of modern French, as we’ll see in a later post, imported into France by the conquerors to be the language of trade and administration, and gradually filtering down to supplant the Gaulish language over the course of six centuries. Gaulish was not entirely wiped out, though: it survives as a language through Breton, one of the family of modern-day Celtic languages that includes Welsh and Gaelic. And if you look carefully you can find a few Celtic remnants scattered in the French spoken today as well. A map of minority languages spoken in France today. You can find Breton and Basque in the far north-west and south-west respectively. According to Henriette Walter, there are no more than about seventy words in modern French that are of Gaulish origin. As you might expect, they mostly relate to a simple life of hunting, fishing and farming, and include terms for common animals and plants. Une alouette (a lark), le mouton (sheep), la tanche (tench, the fish) are some of the creatures that still have Gaulish names. La charrue (plough), le soc (ploughshare), la mine (mine), le sillon (furrow), le gobelet (beaker) and le druide (druid) are a few of the surviving words that testify to the Gaulish way of life. There’s also one single part of the body that still has a Gaulish name, which is l’orteil (toe), plus an old-fashioned word for poo, le bran, which survived at least into the last century. Many of the other Gaulish words describe the natural world, such as la dune (dune), la bruyère (heather), le galet (pebble) or la lande (moor). Among these, since we’re talking about roots, a good number are types of tree, including le sapin (fir), le chêne (oak), le bouleau (birch) and l’if (yew). It’s nice to think that yew and oak trees in particular, often the most magnificent and ancient thing you’ll see in a landscape, are also magnificent and ancient in their names if you say them aloud in French. Le chêne and l’if are words which link the speaker right back to the time of Julius Caesar, and of the Gaulish chieftain Vercingetorix who led the Gauls in revolt against him, and further back to other people who saw these things around them and spoke their names, pronouncing them in a way that may not sound much like the modern names, but which have evolved gradually in an unbroken chain down a hundred generations to us today. Since we’re doing the classics, let’s have a classic of French cinema. 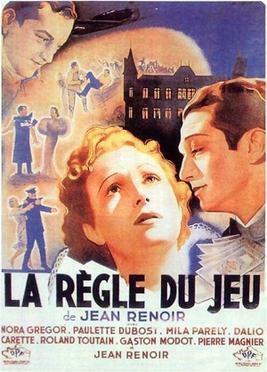 Rated among the top four greatest movies of all time by the British Film Institute, and thoroughly deserving of its reputation, is Jean Renoir’s The Rules of the Game. It’s an upstairs-downstairs story of aristos and servants in a country manor, and if it seems a little familiar when you watch it, that will be because it was Julian Fellowes’s inspiration for his Gosford Park and Downton Abbey, but miles better than either of them. Part bed-hopping farce, part looming tragedy, it is, if you will, a fargedy. Renoir based the film on an old French comedy, but filmed it in 1939, as the approach of the Second World War became ever more inevitable. He described it as his attempt to film a society dancing on a volcano, and there is a palpable sense of doom behind the increasingly frenetic comedy among a group of people whose way of life is about to be swept away forever. If you’ve never watched a classic film like this before, then you’ll have to make a few allowances for its age. It’s black and white, and while a remastered edition exists, image and sound are obviously not going to be as sharp as in a modern film. It also requires a bit more concentration at the start to get to grips with the cast than you might expect in a more recent movie. As in Downton Abbey, there’s a large number of characters above and below stairs. At the centre are Robert, the philandering Marquis de la Chesnaye, and his wife, Christine. Robert is having an affair with Geneviève, but wants to break off the affair to give his relationship with Christine another try. Christine is not actually having an affair with her friend André the aviator, but everyone thinks she must be, after he declares his feelings for her on national radio in the first scene of the film. When Robert and Christine invite their friends, lovers, would-be lovers and hangers-on to a lavish hunting-party at their country estate, tensions are already simmering between many of the characters. And that’s before Christine’s maid, Lisette, wife of the trigger-happy game-keeper, takes a shine to the roguish poacher, Marceau (you’ll like him), whom Robert rashly offers a job among the servants. One other thing: look out for André’s friend Octave, chief among the hangers-on, who knows everyone and sees everything, while always staying on the outside. (As a character, he’s a little like Nick Carraway, the narrator of The Great Gatsby.) He’s the one giving the little speech about the ‘rules’ in the trailer above. It’s worth noting that he’s played by the director, Jean Renoir himself. The weather is getting warm. The sun is shining in a cloudless sky. In the garden, the strawberries are ripening and the clematis is in bloom. In my world, that can mean only one thing: it must be EXAM SEASON! For too long, this blog has been content to inform and entertain. It’s high time we had some Formal Assessment. ‘Chassez l’intrus’ (‘Flush out the intruder!’) is the French language’s rather aggressive and paranoid way of saying ‘find the odd one out’. So, below are five facts about French. Four of them are true*. One of them is false**. 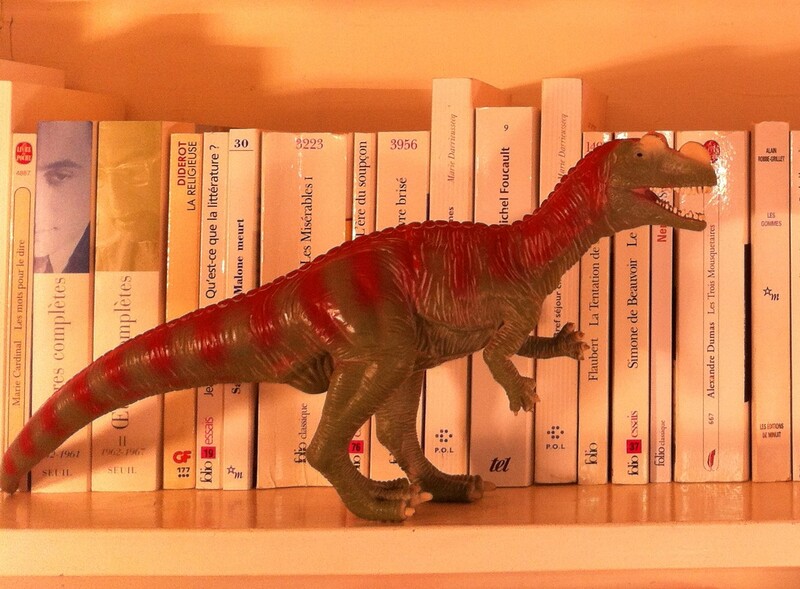 Your task is to chasser l’intrus. * Strictly speaking, four of them are believed to be true by many eminent historians of the French language, which is not quite the same thing, but for the purposes of this examination, we are going to pretend that it is. ** One of them is definitely false because I made it up earlier this morning. A cat demonstrating the principle of the exercise. It is NOT PERMITTED to scroll down to find out the answers until the candidate has plumped for the one they think is fake. It is PERMITTED for candidates to test their French teachers on the facts and see how many they didn’t know, and/or to attempt to persuade them that the false one is true. It is NOT PERMITTED, subsequent to the test, for candidates to immediately forget the four true facts and just remember the one I made up. 1. The reason the French use the same word, pas, for the negative ‘ne… pas’ construction and le pas, meaning a footstep, is that… they’re the same word. In Old French, the negative was made by ne alone, so ‘I’m not walking’ would simply be ‘je ne marche’. If your feet were especially sore, however, you’d be entitled to say ‘je ne marche pas’, or ‘I’m not walking a single step.’ Gradually the pas started turning up in other negatives too, until eventually it became an essential part of the construction. 2. The French word for a hedgehog, le hérisson, derives from a confusion between Anglo-Norman French and Old English at the medieval court of William the Conqueror. King William’s third son, the future King William II (known as Rufus), was famed for his unkempt appearance with long hair and beard. He was mocked by French-speaking courtiers for looking like a hedgehog, and nicknamed by English speakers the ‘hairy son’ of the family. Over time, the cross-linguistic insults merged, and le hérisson became an alternative French word for a hedgehog, and later the accepted name of the animal. 3. The French word for a chair was originally la chaire. It became la chaise due to the fashion among sixteenth-century women to pronounce as a z any single letter r with a vowel before and after it. Chaire has an r sandwiched between an i and an e, so got pronounced ‘chaize’, and later the spelling followed suit. Fashionable ladies of the period would also refer to their husbands as ‘mon mazi’ and to the capital city as ‘Pazis’, but those ones didn’t catch on so well. 4. The French word for a dustbin is la poubelle because bins were introduced to France by Monsieur Poubelle, and named in his honour. 5. English borrowed the French word gentil three times to make three different words. It first entered English as gentle, with the original sense of noble-born (as in gentleman). Then, once gentle in English had shifted to mean mild or kind, we borrowed the French word a second time, now as genteel, to get back its sense of the upper classes. Thirdly, in the seventeenth century we borrowed it again to make the English word jaunty. If jaunty doesn’t look much like the other two, that’s because it’s a (slightly rubbish) attempt to capture the modern French pronunciation of gentil in English spelling. Answers below. No peeking until you’ve made your choice! Fact 1 is TRUE. In Old French you could also say ‘je ne bois goutte’ (I’m not drinking a drop) or ‘il ne coud point’ (he’s not sewing a stitch), along with other similar expressions. The constructions ‘ne…goutte’ and ‘ne…point’ are also still in existence, if rather old-fashioned now, and similarly detached from their original meanings of ‘drop’ and ‘stitch’. Fact 2 is FALSE. But still a good way of remembering the French word for hedgehog. Fact 3 is TRUE. I know, it sounds totally ridiculous, but apparently it really was the fashion to do that, and was mentioned by Erasmus. ‘La chaire’ still exists in French as a rostrum, Papal throne or professorial chair. Fact 4 is TRUE. And is consequently my all-time favourite French word. I shall be returning to M. Poubelle and his amazing new bin idea in another post in the near future. Fact 5 is TRUE. And just dull enough to try to convince you that it was the one I’d made up. If you got the right answer, WELL DONE! If you didn’t, don’t worry – the people who got the right answer were only guessing anyway.